Home > Quizzes > Quiz: Are You a Security Savvy Householder? An Englishman’s home may be his castle, but without the customary features of a moat, battlements and high stone walls, the modern British resident is forced to rely more on their security sense to protect their home. So when faced with invading hordes, how security savvy are you? ... what should you do first? (A) Quickly find a weapon, such as a garden tool, and enter the house ready to tackle any intruder. (B) Enter the house cautiously and shout out to see whether anyone is around. (C) Without entering the house, go to a neighbour and call the police. 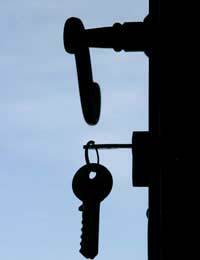 (D) Quickly close and lock any open doors from the outside in the hope of trapping the burglar inside. Following this, phone the police. ...what should you NOT do? (A) Make a noise in the hope it scares them off. ... at the door what’s the first thing you should do? (A) Welcome them into your home for a cup of tea. (B) Open the door and ask for the stranger’s identification. (C) Hide yourself away from the window until they walk away. (D) Look through a window or a spy-hole to see who it is. If they look suspiciousthen don’t answer it – official callers always make appointments first. ... how should you answer? (B) With your surname and last four digits of your number. (C) By saying nothing at all. ...is both an effective AND legitimate deterrent to burglars? (A) A large prickly bush. (D) A ‘Beware of the Dog’ sign. 6. When should you activate your burglar alarm? (A) Whenever we go out. (B) Both when we’re in bed at night and when we’re out. (C) Just when we go on holiday. 7. Which of these dog breeds would make the most effective guard dog? ... which of these is NOT a convincing way to make it appear like you are still at home? (A) Using a timer system to regularly switch on the radio to a talk station. (B) If you have gone away in your car then get a neighbour to park theirs on your drive. (C) Keep all of the lights in the house switched on. (D) Get a neighbour to collect post, put out your bins, and open and close your curtains. 9. Which of these is NOT a common type of bogus caller? (A) The bogus antique dealer. (B) The bogus water board representative. 10. Which of these is a good place to leave your spare house keys? (A) Under a plant pot. (C) At your neighbour’s house. (D) Buried under a rock in the flower bed.